Leonid (“Leo”) Garbuzov was born in Moscow, Russia. He came to the United States at the age of 11 and grew up in Michigan. In 2001 he received a Bachelor of Arts degree with High Distinction from the University of Michigan-Ann Arbor. He then spent two years working as a law clerk at several Michigan-based law firms. Leo graduated from the Boston University School of Law in 2006. As a student, Leo received numerous academic honors, including being named a National Merit Scholar. He held memberships in numerous honor societies, including: Phi Kappa Phi, Phi Beta Kappa, Golden Key International Honor Society, and the National Society of Collegiate Scholars. He gained admission to the State Bar of Michigan in 2007. While attending law school, Leo Garbuzov worked as a law clerk in Boston Massachusetts, and in Birmingham Michigan. Since becoming an attorney, he has worked for several Michigan and Ohio based law firms specializing in areas including intellectual property litigation, civil litigation, family law litigation, and criminal defense. Leo has also conducted extensive research and authored or contributed to legal publications pertaining to business law, employment law, immigration law, and intellectual property law. 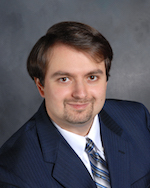 Leo Garbuzov founded the Garbuzov Law Firm, PLLC in December, 2009. Since that time, he has been assisting clients with a variety of legal matters, specializing primarily in family law, criminal law, civil litigation, immigration, real estate and probate law. During that time he has represented a variety of clients ranging from private persons to international corporations. He is especially proud of working extensively with the Hispanic, Russian, Ukrainian, Arabic and Asian communities within the State of Michigan. The Firm is proud to represent clients from a variety of ethnic, economic and social backgrounds and to provide exceptional service and highly individualized solutions based upon each client’s specific needs. Leo Garbuzov is completely fluent in reading, writing, speaking in English and Russian and has extensive verbal proficiency in Spanish. He can therefore fully assist Spanish and Russian speaking clients in their native language. Below is a list of Leo Garbuzov’s legal publications, presentations, memberships, and other legal accomplishments and recognitions. Bruce Warren and Leonid Garbuzov, To Live, to Work, to Prosper: Do Illegal Aliens Have Legal Rights?, 41 Husson Bus. L. Rev. 207 (2008). Bruce Warren and Leonid Garbuzov, Ethical Concerns And Considerations For Organizations In The New Millennium, 39 Husson Bus. L. Rev. 147 (2006). Leonid Garbuzov, Note, A Struggle To Preserve Ethnic Identity: The Suppression of Jewish Culture By The Soviet Union’s Emigration Policy Between 1945-1985, 23 B. U. Int’l. L.J. 159 (2005). “How to Deal With Non-Payment”, 2013 Annual Conference for Translators and Interpreters (October 12, 2013). “Insurance Coverage for Freelancers”, 2011 Annual Conference of Michigan Interpreters and Translators (Oct. 1, 2011). “Translator & Interpreter Liability – Noteworthy Cases”, Michigan Translators/Interpreters Network, Berkley, MI (Feb. 19, 2011). “Facing Foreclosure - You Are Not Alone”, Family Independence Program, Pontiac, MI (Nov. 16, 2010).